Because everyone loves the bedazzled look of the diamond encrusted gold teeth, we offer iced out products for both the top and bottom row of teeth. Our diamond look is comprised of cubic zirconias, which is a great reproduction of the diamond look at a much affordable cost. 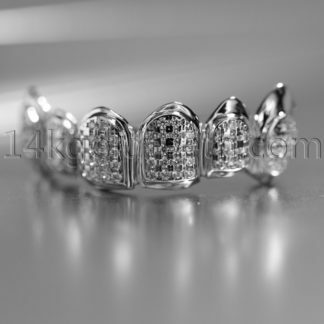 The dazzling look of the finished product will have everyone turn their heads when the owner of the iced out grillz flashes his or her smile. This is a great product to complete a sophisticated wardrobe for a great night out with friends. Some customers ask us how we create the diamond look on our products. Since we provide custom gold teeth, all of our items are created by hand. Each set of teeth is shaped differently, so we cannot use a machine to install the iced out look. Our designers meticulously place every diamond into each custom design. This skill takes time and precision in order for all of the diamonds to align perfectly. Our designers are trained to place each diamond in a proper manner so that our customers will have their perfect iced out grillz to show off to all of their friends and families. Because everyone has his or her own preference of how many teeth should be bedazzled, we offer a variety of pieces to accommodate everyone’s needs. We offer 4pc, 6pc, and 8pc to complete this chic look. However, if the number of pieces that a customer would like is not listed, we are more than happy to place a custom order. There are also customers who do not want the entire bedazzled look but rather only a few mixed with other designs. This is also possible through custom orders. Our company can create custom orders to coordinate the needs and wants of the customers. For any designs related to the iced out design or a combination of multiple designs, please contact customer service for further assistance. 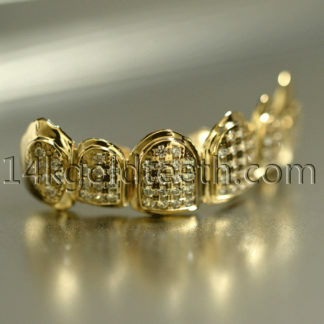 At 14kgoldteeth, we offer a variety of pieces to fulfill your perfect product. We also offer a variety of metals to compose the look that will turn heads. For our sophisticated iced out products, we offer yellow gold in 10k, 14k, and 18k. The different karats in yellow gold represents the amount of gold that we use in each product. The higher the number of karats, the higher the amount of gold is used in creating the product. The lower the number of karats, the lower the amount of gold is used in creating the product. Generally, the more gold that is used in creating the product, the more delicate and longer lasting the product will be. We also offer silver iced out products. All of our iced out silver products is comprised of 925 sterling silver. Currently, we do not offer iced out designs in white gold or rose gold. How do I get my grillz to fit my teeth? This is a common question that we often receive. Our company is a custom gold teeth designer, which means that we create products to fit the teeth of the customer. Because everyone has different sized teeth and teeth alignments, we first create an impression of the teeth. To do this, we provide a mold impression kit to create the teeth impression. Once we have the teeth impression, we create the product according to the style and design that the customer has asked for. This procedure is very important so that the grillz will fit perfectly into the customer’s teeth. Many companies nowadays sell pre-made grillz for convenience. However, it is very crucial that customers pay attention to the fit and placement of the grillz because incorrect placement may damage the teeth. For this reason, our company provides custom products so that the gold teeth will fit perfectly, without damaging the teeth. How do I clean my grillz? Developing good cleaning habits for grillz is an important habit for all people who own their own set of grillz. They are constantly in the mouth, then taken out with eating or drinking, and put back in again. Whenever one touches his or her teeth, bacteria is accumulated onto the teeth from the hands. If the product is not properly taken care of, the product will not last very long. To fully deep clean the product, first place the teeth in a cup of warm to lukewarm water for several minutes. Then, using a soft bristle toothbrush and non-grainy toothpaste, brush the teeth both inside and outside. Next, rinse off the residue and dry completely with a soft cloth. Repeating these simple steps every night should help eliminate any bacteria and residue that may build up in the teeth throughout the day. There are several important reminders to keep in mind when determined to clean the statement fashion accessory. The first reminder is to never use any kind of chemical or fluid that contains alcohol. Alcohol is a strong chemical reactor that will instantly change the color of the gold teeth. The second reminder is to always use a soft bristle toothbrush to clean the outer and inner parts of the teeth, and make sure to get all of the hidden crevices because that is where the bacteria may build up. The third reminder is to clean the teeth using these steps provided at least once a day. Taking care of the gold teeth is just as important as wearing them, so people should remember to clean the teeth properly to get their smile shine.